There is not a free grain of sand in America. I will return to the point. In 2004, I presented a paper at the Mid-Atlantic Popular Culture/American Culture Association Annual Conference in Buffalo, New York. I enjoy the people at these conferences for their open enthusiasm. I respect the organizations because they are open to all, a far cry from elitist groups like College Art Association or Modern Library Association. Weekends in downtown Buffalo, where our events were taking place, is extremely quiet. Buffalo is one of those American cities whose industrial prestige vanished long ago. During our visit, downtown was host to artists’ lofts and professors from nearby State University of New York. While returning home, I rode a municipal bus to the airport through a residential district that was predominantly African American. I did not see much outdoor activity; it was November and somewhat cold. But I took in the city as it was. The bus route is long. Along the way, we passed many boarded up storefronts. The only sign of life I saw that afternoon was a McDonald’s restaurant. Immaculately clean and operational, this was the only business I noticed that had its own perimeter, a square area of parking lot completely surrounding the building. A perfect metaphor, this vision of America takes into account a post-industrial malaise that includes the disappearance of manufacturing prowess, except in matters of war, the evacuation of jobs from the country, the rise of a service sector that keeps the luckier ones employed without the security or benefits the country could once boast about. People cope with this state of affairs in many ways, significantly, a portion of the population by moving from joblessness to state dependency. San Francisco has a huge social safety net. There are city and state offices and services that take many forms. There are non-profit organizations and religious organizations feeding, housing, and assisting with job orientation, training and seeking. True, the non-profit sector is hurting badly during the current economic collapse. I recently read an online article about disability claims spiking each year during the current economic crisis. And apparently, disability claims have historically climbed whenever the jobless rate has risen. I know that if I were to apply for disability status as an AIDS-afflicted person a case could eventually be made and won, even through one or more denials and counter petitions and one to several years of patient determination. I continue to choose not to apply because I want to work. A disabled person receiving benefits can work, but their access to working hours is limited by law. I have had many friends over time who chose to apply and receive disability benefits living with HIV/AIDS. In the early years of the pandemic, individuals were overwhelmed by the nightmare of the disease. One way to keep their sanity was to move away from stress-producing work environments. Disability status helped people successfully navigate away from these situations. Stress kills people with life-threatening illnesses. Marijuana can be a friend to those suffering from AIDS and certain side effects that attend. Medical marijuana dispensaries are appearing everywhere in the city now. They are becoming ubiquitous, as Starbucks once was with a store appearing seemingly on every block within major cities like New York. In 2009, I listened to two young Introduction to Horticulture classmates discussing strategies for obtaining a medical prescription for marijuana. We were in the greenhouse at City College of San Francisco. The one student talked about an injury to his lower back and how he managed to eventually obtain a permit to use medical marijuana for the problem. He spoke about the matter to his classmate without signs of mobility impairment as we all squatted and reached beneath tables to remove weeds. They made it sound so simple. It was as simple a matter for me to obtain marijuana when I began smoking at age 15. Law enforcement did not catch up with me until 33 years later. I have somewhat lost my appetite for the stuff, but still believe it should be legal whether or not it is used for medicinal purposes. There are a class of people entirely outside of the jobless social safety net. They occupy space wherever they can find it. I see them receiving tickets for violating the new sit/lie law in the city that forbids them to tarry on sidewalks. A law like this, though, does not change the number of homeless in the city. They sleep in alleyways and in front of empty storefronts, in Golden Gate Park, anywhere possible. I once tried to find an open space to sleep with my friends Patrick and Tina. Tina was moving to Hong Kong. It was the last day Patrick and I would see her in New York. We decided to drive to Long Island and find a quiet seaside location to pitch a tent. We were equipped with food for a meal and wine to toast to our friend’s success in her new role as a curator overseas. Our first stop was at Robert J. Moses State Park. We arrived sometime after 11:00 PM. How elated we were to have lapping waves welcome us. Our pleasure was destroyed minutes later as a State trooper drove up in his Jeep, headlights blinding us. He barked the command to pack and leave, but not before we insisted on a recommendation for completing our plans. We drove to Heckscher State Park that had campgrounds bay side. By this time it was past midnight. Because our energy was flagging we ignored the ranger’s station and drove to a deserted camp site. Again our happiness was premature as we were chased out for having assumed squatter’s rights. Defeated, it was time to head back to Manhattan. We looked for a motel on our return. Our next stop was again disappointing, but not without some comic relief. Having parked the car in view of the office, Patrick and Tina walked ahead of me toward the front desk where a middle-aged woman stared at us with God’s conviction behind her eyeglasses. Their encounter was brief; before any questions were asked, all she would say was “we don’t have those kind of rooms here.” A few more miles down the road we reached a motel where the proprietor took us in without question. We entered our room tracking in sand and weary relief. 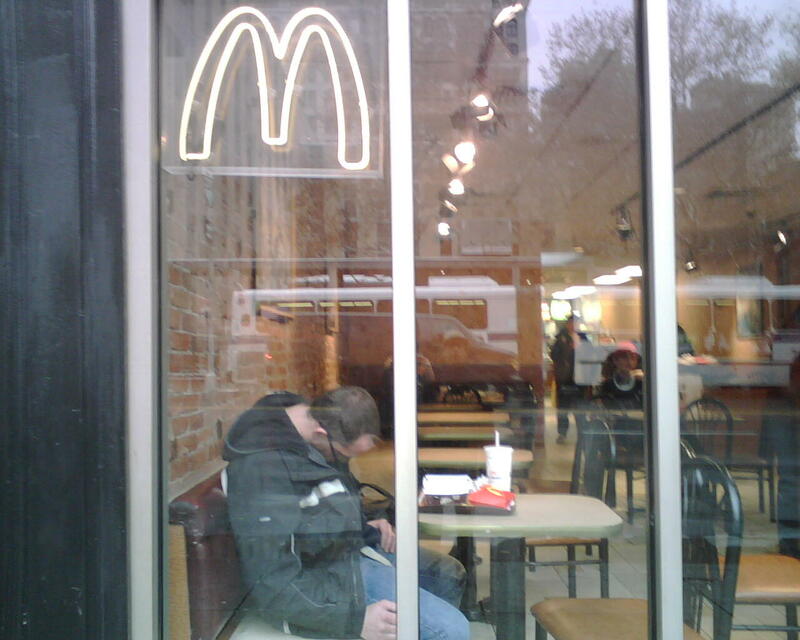 Max Yawney, untitled photograph (McDonald’s near Astor Place, New York), circa 2007.